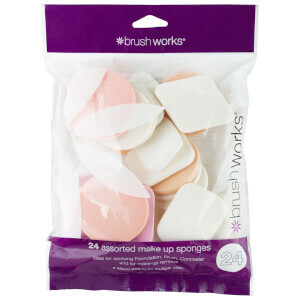 Blend to perfection with the brushworks HD Midi Sponge Set; a four-piece selection of various shaped makeup sponges for a variety of applications. Suitable for use wet or dry to achieve different finishes, the premium makeup sponges won’t absorb product for minimal waste and effortless application. Each sponge has been specially shaped to allow for seamless blending with specific designs to strobe, contour and conceal. Ideal for foundation, blush and powder formulations.